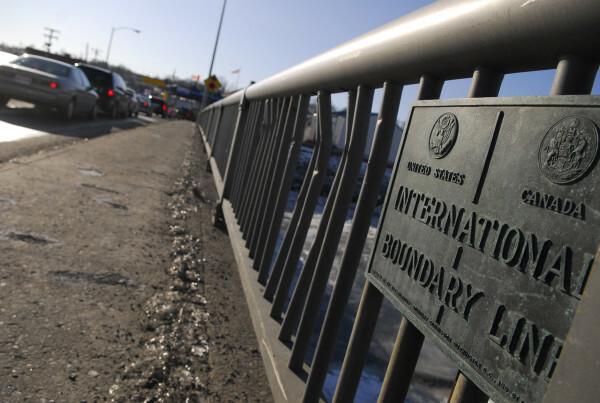 A plaque on the bridge over the St. Croix River between St. Stephen, New Brunswick and Calais, Maine marks the international boundary line. HEMMINGFORD, Quebec — Canadian police said on Monday they had bolstered their presence at the Quebec border and that border authorities had created a temporary refugee center to process a growing number of asylum seekers crossing from the United States. A Reuters reporter on Monday saw RCMP officers take in for questioning a family of four — two men, a woman and a baby in a car seat — who had walked across the snowy gully dividing Roxham Road in Champlain, New York, from Chemin Roxham in Hemmingford, Quebec.